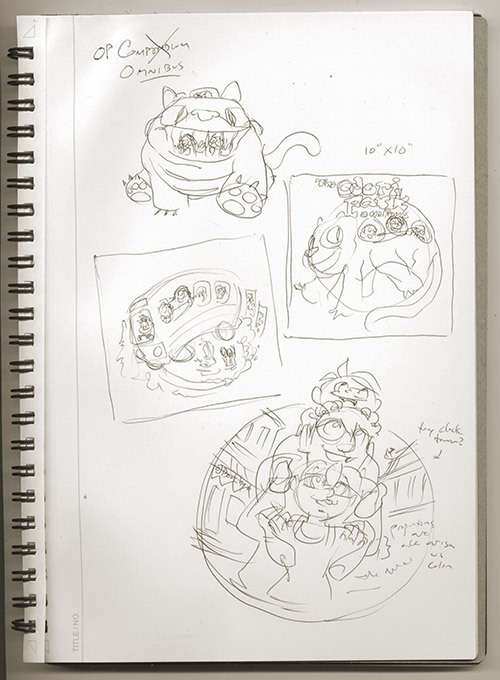 Click the thumbnail image to get a closer look at the sketches. I’m going to try and post some sketches about my other 2014 project–the kids’ graphic novel–soon, maybe later this week or at the beginning of next week. 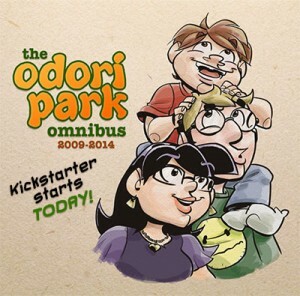 The Kickstarter to print The Odori Park Omnibus is now officially live! I’m super psyched to see how this goes. I’ve never run a Kickstarter campaign before, and I have high (albeit realistic) hopes. I’m also anxious. 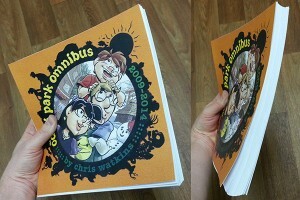 With how much I want to see this book in the flesh (it’s going to be huge! Over 600 comics, and nearly 250 pages, by my count! ), plus the Maine Comics Arts Festival just around the corner in May, where I hope to debut the book, it feels like I’ve got a good load of work and worrying ahead to occupy the rest of April. So, without further ado, please check out the Kickstarter page for The Odori Park Omnibus and “pre-order” yourself a copy with a pledge! You can also grab some unique reward items including prints of the comic and special edition bookmarks, as well as commission me to create custom artwork (which I hardly ever do these days)! 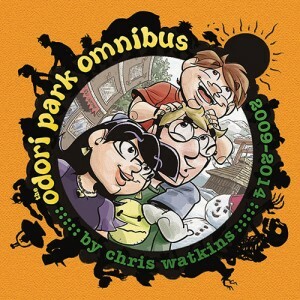 Last night, I talked with Kurt Sasso on his Two Geeks Talking podcast about wrapping up five years of the Odori Park comic strip. 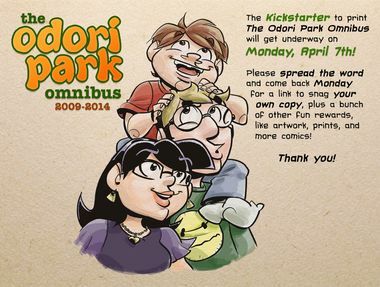 We really covered a lot of interesting ground, from the Kickstarter to print the Odori Park Omnibus (which, by the way, ends in about a week, and needs just a couple hundred dollars to meet the goal–so pleeeease go preorder! ), the evolution of an artist’s craft over time, getting support from your family, and acknowledging and working through creative stagnation. 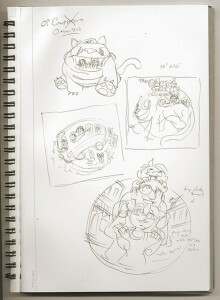 We also talked about my upcoming projects, and I gave up some spoileresque details on my kids graphic novel. Thanks, everyone, for the continued support! I am psyched! 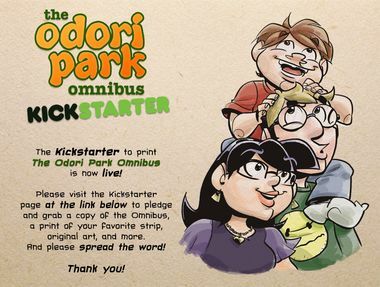 The Kickstarter to fund printing of The Odori Park Omnibus has reached its goal amount! That means I’m on track now to start printing up books in May, and the book will become an honest to gosh thing. Yay! Thank you to everyone who has pledged, shared the word, and supported the effort. This has been a great experience, and I appreciate what you’ve all done. If you haven’t preordered a copy through the Kickstarter yet, please do pop over and grab one! You can pledge for a copy up to the 30th, when the campaign officially closes. More updates to come on progress of the Omnibus, but for now, just a Friday woo-hoo! Thanks a million (or 2,500) for all your pledges, links, and support. Now that the project has reached its goal amount, The Odori Park Omnibus is on its way to becoming a real live boy. Naturally, I’ll continue to keep you all abreast of progress with more posts. Just wanted to take a moment to say thank you, and woohoo! Oh, and please do continue to make pledges and spread the word–the more the campaign brings in, the more books I can print for people! The Maine Comics Arts Festival is this weekend, on Sunday the 18th. I don’t do a lot of shows in a given year, so if you’re in New England this weekend, please consider stopping by. 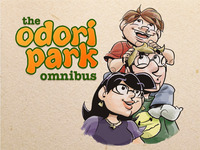 Here’s a link to the MeCAF site: mainecomicsfestival.com. Kazu Kibuishi, Ben Hatke, and other creators I admire will be there, so I’m going to have a hard time sitting still behind my table. Recovering from the Maine Comics Arts Festival today. It was a good time! Pleasantly surprised by the number of kids there–including behind the tables. Some really talented young’uns out there! Also surprised by the number of sketches I wound up doing of Minecraft creatures. Now that MeCAF is out of the way, my next priorities are to get the Omnibus up for sale on the site, and to survey Kickstarter backers on their shipping addresses and other pertinent info. A big thanks to everyone who came by the table on Sunday, and to my table-pal John Forcucci, and our table neighbors, Chris and Corey.